“Thanks again for your being there, we're very lucky to have you.” - Chuck J. Welcome to all of the new CDx3 Newsletter readers who signed up during February. This is your first issue of the CDx3 Newsletter, a free monthly newsletter devoted to the interests of CDx3 Preferred Stock investors. In the Last Month's CDx3 Investor Results article I breakdown three key events that were most relevant to preferred stock investors during February: the February 10 announcement of Treasury's new Financial Stability Plan and its treatment of preferred stock dividends; the latest information regarding the plan to deal with the toxic assets that are plugging up our financial and credit systems; and how the CDx3 Selection Criteria saved CDx3 Investors once again by steering them clear of the late-February mess at Citigroup. 2009 could very well be the year of transition for our economy. Much will be written about the programs now being put into place by our government and business leaders. In the Special Announcement article I provide a link to a new offer from Amazon that is valid until the end of March. Amazon is bundling my book, Preferred Stock Investing, with a whopping 50% off deal on the most popular business and personal finance magazines. Plus, they are knocking $2 off of the retail price of Preferred Stock Investing as well. Be informed during 2009 and take Amazon up on this timely offer. In the CDx3 Company Spotlight article I introduce you to Weingarten Realty, issuer of CDx3 Preferred Stock. We've all heard how desperate these times are for everything connected to retail. Sales are down, personal savings are way up. So how is it that Weingarten, owner of 374 retail shopping centers across the country has a 92% occupancy rate and posted a net income for 2008 exceeding $115 million? I also provide you with a link to see if you are shopping at a Weingarten shopping center. "The government is now giving big banks a stress test. Will these banks be allowed to fail if they fail the test?" This question was on the mind's of millions of investors all over the world after the February 10 Financial Stability Plan announcement by Treasury secretary Geithner. While Geithner said what would happen to banks that pass the test, he omitted the small detail regarding those banks that do not. I answer this question in this month's CDx3 Question Of The Month article. What was being referred to as TARP 2 was renamed as the Financial Stability Plan during February but many key details were left out, such as how we are going to deal with the toxic assets that are preventing banks from lending. March may very well be seen by history as a transition month where the stress tests to identify the capital requirements of our financial system for the next two years and the toxic assets are finally dealt with, allowing banks to start lending again. Subscribers to the CDx3 Notification Service receive "CDx3 Flash" messages from me as these types of key events unfold. My focus is always on how such programs affect the marketplace for CDx3 Preferred Stocks. Historically, recoveries start with increasing demand for the safest investment instruments first, corporate bonds and the highest quality preferred stocks - "CDx3 Preferred Stocks." March could become very important for preferred stock investors but whenever the big recovery gets underway it will be subscribers to the CDx3 Notification Service who are in the front of the pack. Please consider subscribing to the CDx3 Notification Service as these events are upon us right now. Three key events over the last few weeks were critical for preferred stock investors – Treasury secretary Tim Geithner’s Financial Stability Plan (FSP) preserved preferred stock dividends issued by government assisted banks; the much awaited toxic asset plan finally appears to be coming together; and the CDx3 Selection Criteria saved CDx3 Investors once again by successfully filtering out the three Citigroup preferred stocks that were converted to Citi’s near-worthless common stock on February 27. (3) The FSP reaffirms private ownership of our banks. While there was much debate regarding nationalization of U.S. banks during February, it was Fed chairman Ben Bernanke’s February 24 sworn testimony to congress that seemed to calm most of these fears. All three of these FSP provisions are long-term positive for preferred stock investors. Look for a very positive reaction from the market when Geithner presents a workable plan to deal with toxic assets on bank balance sheets. The Wall Street Journal (online) posted a story late in the day on March 2, 2009 saying that the toxic asset plan was starting to gel. According to the article, Geithner’s plan will use a group of privately managed investment funds that would contain these toxic assets. Not all of these underperforming assets are worthless, just a lot of them and no one knows which are which (hence the problem). Under the fund model, a fund would contain a collection of these underperforming assets (kind of like a mutual fund contains a collection of common stocks). Investors would purchase shares in the fund for pennies on the dollar of the original value of the assets that are in the fund. It would therefore only take a small fraction of the assets to perform in order to offset the losses of the ones that were in fact worthless. I heard an interview on Bloomberg radio with the manager (I did not catch his name) of just such a fund that contains distressed assets backed by underperforming residential mortgages. He has been managing this fund for many years and claimed that over the last year they have been doing exactly what the WSJ is now saying Geithner wants to do with these toxic assets. The man being interviewed claims that the funds they have set up during this Global Credit Crisis have averaged a 15% annual return. Under this model, it only takes one good apple to pay for the whole batch of rotten ones. Whatever the details, the market should react very positively (even explosively so?) when Geithner announces a workable plan and it is starting to sound like that announcement might happen this month. Since investors tend to favor lower risk investments first during a recovery, CDx3 Preferred Stocks*, which are the highest quality preferred stocks available, are well positioned to ride the wave once Treasury puts the plan in place. Subscribers to the CDx3 Notification Service are provided with the CDx3 Preferred Stock catalog that lists dozens of currently trading CDx3 Preferred Stocks from a wide variety of industries. Each CDx3 Preferred Stock listed in the catalog includes a CDx3 Spec Sheet with complete details and a link to the prospectus on file with the Securities and Exchange Commission. Updates and the latest preferred stock research are also provided to subscribers each month in the subscriber’s exclusive newsletter CDx3 Research Notes. Average CDx3 annual yields are currently well north of 10%. Please consider subscribing to the CDx3 Notification Service and start your plan to ride the recovery. Announcing a solution to the toxic assets on bank’s balance sheets could very well be the trigger that the market is waiting for. There was a big dust-up at the end of February regarding Citigroup and its preferred stocks. The CDx3 Selection Criteria hit another home run for CDx3 Investors. Let me break it down for you. Prior to February 27, Citigroup had 14 preferred stock issues trading on the open market plus other custom-made preferred stock issues owned by the U.S. government and others. Here are Citi’s 14 preferred stock issues. Only 4 of Citi’s 14 preferreds qualify as CDx3 Preferred Stocks; the CDx3 Selection Criteria filtered out the rest. Notice that the bottom three are “convertible preferred stocks.” The others are either Trust Preferred Stocks or Enhanced Trust Preferred Stocks. Convertible preferred stocks are preferred stocks that allow the issuing company (Citigroup in this case) to convert the shares of these preferred stocks to shares of common stocks at a certain conversion ratio and under certain conditions. On February 27 Citigroup exercised their right to convert their three convertible preferred stock issues (C-I, C-P and C-M) to common stock. Citi then suspended the dividend payments on its common stock leaving investors who were holding shares of these three convertible preferred stocks high and dry. CDx3 Selection Criteria number 8 eliminates convertible preferred stocks because of the uncertainty surrounding the conversion. The risk-lowering focus of the CDx3 Selection Criteria allowed CDx3 Investors to sidestep Citigroup’s February disaster. On March 2, 2009 Citi announced that it would continue to pay the dividends on all four CDx3 Preferred Stocks. This announcement continues the perfect track record of CDx3 Preferred Stocks having never missed a dividend payment – ever. But make no mistake here. Citi is obviously in very fragile condition and could very possibly become the first ever issuer of CDx3 Preferred Stocks to either defer a dividend payment or even become insolvent. But no CDx3 issuer has ever done so. The ten CDx3 Selection Criteria that separate CDx3 Preferred Stocks from the pretenders have successfully filtered out every failed bank during this Global Credit Crisis - New Century, IndyMac, Freddie Mac, Fannie Mae, Washington Mutual, Lehman Brothers and the others were all filtered out. CDx3 Investors have received every dividend payment in full and on time. But I think we all know that there are no guarantees, especially in this economy. Citi’s future, and that of several other banks, is now tied to Tim Geithner and the eventual plan for dealing with the toxic assets that are plugging up our credit markets. Providing a solution to this problem soon will be a massive positive boost to the economy, these systemic banks and to everything and everyone connected to them (which is just about everything and everyone). Amazon is running a great promotion for Preferred Stock Investing this month and I wanted to be sure that you knew about it. 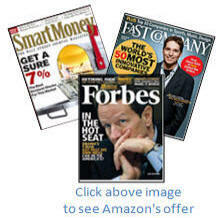 Through March 31, 2009 you will receive 50% off of a subscription to popular business and personal finance magazines when you purchase Preferred Stock Investing. As I read a lot of the articles from these types of magazines, for me they fall into three categories - (1) interesting to someone other than me; (2) generally interesting to me but nothing actionable; and (3) on point information that is useful to me right now. Articles in this last category are what I'm really looking for and, frankly, they happen at a rate of about one every couple of months. But it is these gems that have saved or made me several hundred or even thousands of dollars so the few bucks for the subscription is easily worth it to me. At 50% off, this is a slam dunk and I'm happy to make you aware of Amazon's offer. And here's the best part- Amazon has knocked $2 off of the price of Preferred Stock Investing as well. 2009 is going to be a historically important year for our economy in general and for investors in particular. Buy the book at $2 off and get 50% off of these great business and personal finance magazines at the same time. Weingarten Realty is a $1 billion real estate invest-ment trust headquartered in Houston, Texas and founded in 1948. Weingarten’s primary line of business is the development, ownership and management of anchored neighborhood retail shopping centers. As of December 31, 2008, Weingarten owned or operated under long-term leases, interests in 374 developed income-producing properties and 30 new development properties, which are located in 23 states that span the United States from coast to coast. Included in their portfolio are 323 shopping centers and 78 industrial projects. These properties make up approximately 47.6 million square feet of leasable area. Weingarten's properties were 92.6% leased as of December 31, 2008, and historically enjoy an occupancy rate that has never been below 90%. Weingarten’s common stock has been upgraded by three different analysts (to long-term buy, buy and neutral) since last November including a January 13, 2009 upgrade by JP Morgan. While 2008 was not quite as profitable as many prior years for Weingarten, knocking down record profits is not a goal of many shopping center developers in the current economy. While many of its peers struggled, Weingarten posted $115 million in net income last year. Perhaps Weingarten’s success is due, at least in part, to its strategy of favoring large discount retailers as anchors in many of its shopping centers. Click here to see if you are shopping at a Weingarten center. The government is now giving big banks a 'stress test.' Will these banks be allowed to fail if they fail the test? - Tim O. On February 10 Treasury secretary Tim Geithner announced a framework for Treasury’s new Financial Stability Plan (FSP). One aspect of the plan provided for a “stress test” that our biggest banks would have to take (see FSP Fact Sheet paragraph 1a). While Geithner did say what would happen to banks that passed the test (they would qualify for additional government funding), he failed to say what would happen to banks that failed the test. This was a major screw up. The market hates uncertainty. By not making clear what would happen to banks that failed Treasury’s stress test the market filled in the blanks on its own and assumed that these banks would just be allowed to fail. The common stock prices of these banks took yet another dump on this lack of news from Treasury. On February 27 Fed chairman Ben Bernanke cleaned up Treasury’s mess as far as the stress test goes. The following day, February 28, subscribers to the CDx3 Notification Service received their exclusive monthly newsletter – CDx3 Research Notes – that provided the details and corresponding analysis. To summarize his testimony, Bernanke explained that the stress test was not a pass or fail type of test. Rather, the stress test is designed to calculate the amount of cash that our biggest banks would need in the event that the economy (meaning default rates and asset devaluations) did not turn around for another two years. In other words, the stress test is a cash planning and budgeting tool, not a pass/fail test of the bank’s viability. Geithner REALLY should have made that point on February 10. Not doing so fanned the flames of uncertainty that were already roaring. Thanks to Tim O. for the great question. You will receive a free copy of the CDx3 Special Report "Dividend Accounting." The 19-month long credit crisis has shaken our financial system and everyone who is invested in it (which is just about everyone). Even though the CDx3 Selection Criteria, day after day, have successfully filtered out every failed bank for over a year now, and even though there has not been so much as a missed dividend for those who have invested in CDx3 Preferred Stocks, there's still some anxiety. The stress test component of the Financial Stability Plan got underway last week. The tests will determine the amount of capital needed by our 19 'systemic institutions' for the next two years if the economy continues on its current path. When the results are announced, perhaps during March, Treasury is going to make commitments to these banks in accordance with those capital needs. This should be a huge boost for the market in general and preferred stocks in particular. But the big news that the market is hoping for during March is the announcement of the plan for ridding our banks of the so called toxic assets that are plugging up our financial system and access to credit. No one knows better than Treasury secretary Tim Geithner what is on the line here. Geithner got rushed into a premature announcement on February 10 - providing a general framework when the market was demanding details. Don't expect him to make that mistake again. When Geithner takes the microphone again he is going to have something to say that has the potential, along with the multitude of other programs now being implemented, to force a bottom under this market. Under such conditions, investors have historically eased their way back into the market starting with the lower risk alternatives first such as corporate bonds and the highest quality preferred stocks - CDx3 Preferred Stocks. If Geithner gets the job done within the next week or two expect to receive an update from me. Otherwise, I will report back to you in next month's issue of the CDx3 Newsletter.